The ultimate paint finish will always come from a polishing machine. However, in inexperienced hands, the results can be disastrous! Amateur detailers shouldn’t be put off though as with time, care, knowledge and practice, anyone can achieve a paint finish to be proud of. There are two main types of machine - dual action and rotary polishers. Dual action machines are the perfect way to get into machine polishing. As well as spinning, they also oscillate, and this results in a random orbit so paint remains cooler and less material is removed than with a rotary polisher – reducing the chance of paint damage. Dual action machines perform brilliantly with products like Scholl S30+ for burnishing the paint and can impart a serious gloss before you apply any wax or sealant. Rotary polishers differ from the dual action machine as they spin on a fixed axis. In the wrong hands they can cause damage as they remove paint in a more aggressive way (we’ve all seen used cars quickly mopped for sale in a dealership and covered in holograms as a result!). Used correctly with the correct compound and finishing polishes it is possible to create a flawless finish. A rotary polisher can work the diminishing abrasives further for an amazing gloss, perfectly corrected, and high gloss polished paint can look outstanding. 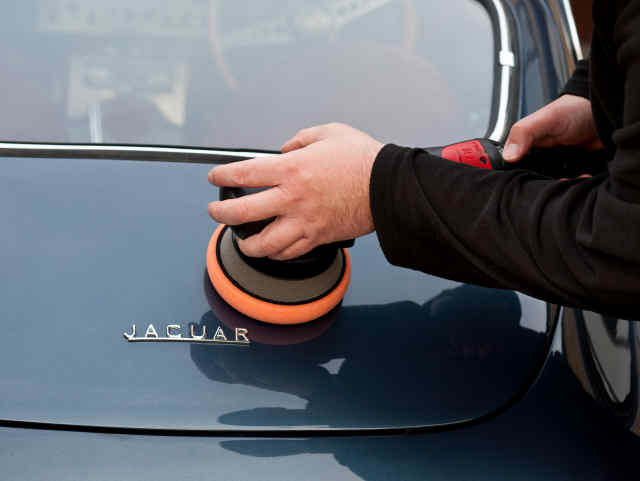 It’s not unusual for paint correction to take 30-50 hours and can involve a cutting compounding stage, a medium polish, followed by a high glossing finishing polish for defect- and hologram-free paint. If you own a classic car, consider whether you want to achieve a flawless finish. It’s down to personal preference but some Concours judges expect to see paint defects on an old car. Many people prefer to see signs of aging on a classic vehicle’s paintwork, otherwise it can look like it’s had a complete re-spray or restoration. If you want to have a go at machine polishing, get your hands on a scrap panel and have a play. When you move onto the real thing, start with the least aggressive compound and work your way up until you get the desired result. Modern compounds are suitable for use on the old one pack cellulose paints as well as modern two pack and clear coats. Old, single stage paints tend to be softer and require less aggressive compounds or polishes. All colours can be corrected and reds, which we often get asked about due to their propensity to fade, come up particularly well with Scholl Concepts S30+. Spautopia is a family-run business committed to providing you with unique, quality, professional grade products, rapid delivery and unsurpassed customer service. From our tried, tested and trusted range, we strive to help you select the right product for your needs – with helpful tips, advice and videos online, customer reviews, testimonials and a knowledgeable team who are always happy to answer your email or telephone queries.